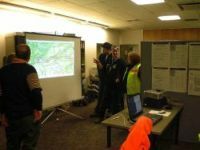 The way Land Search and Rescue has worked, and it still working, is based on paper maps, the compass, and in later years, radios and even portable GPS units. 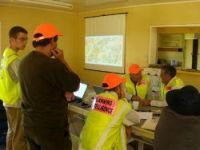 Search teams take a topographical map with them, and on a regular basis need to stop, try to find their own position on the map, using compass, local features, and then radio his information back to the operations center using short-hand NZMG Grid coordinates. 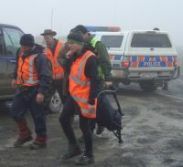 Lately, some teams carry portable GPS units with them, but they then have to try to extract the right digits out of the full GPS NZMG coordinate system, and transmit these back to base over the hand held radio. At the operations center, the radio operator writes this down, and passes it on to the controller, who then has to locate the position on their own paper map, and mark it. This system is extremely tedious, time consuming, clogs up the radio channel, and prone to error. Now imagine a system where the location of all search teams shows up live on a computer screen, or a video projection, overlaid on a digital topographical map. Not only the team's current location, but with multi coloured tracks, an arrow in which direction the team travels, and a label with additional information like altitude, speed and the coordinates in either 'GPS' or NZ MapGrid format. Not only the position of the teams in the terrain is clear, but also the relative position to each other can be seen with a single glance at the screen. A search area can be drawn on the screen, and special Icons, with detailed information attached, can be added. It is immediately clear if areas have been covered, or missed in the search. If a team finds a person, or if they run into trouble themselves, they can trigger a Priority Message, which will cause an visual and audio alarm to go off, and a special Priority Icon will show up on the screen at that location. Other teams can then immediately be dispatched to that location, and directions can be given to them by the controller, who can see, live, where all teams are. If a team takes off in the wrong direction, or into the wrong valley, this can be immediately corrected by the controller. So, this system works exactly opposite as the current situation. It is not a question that the teams try to give their location to the controller. The controller knows where the teams are, and he can tell the teams where they are, and where he/she wants them to go, which is the way it should be. As described on the Software page, many other features are available in the SARTrack program, all especially designed for SAR use. There are other tracking systems available, based on a satellite link, or a cellular connection. These systems work well for the purpose for which they are designed. Systems designed to work over the cellular network, only work when you have cellular coverage. This is often not the case in many search areas, and especially not when teams disappear in dense forest of deep gullies or valleys. It is unsuitable for SAR use. There are two basic satellite tracking systems. One uses a Geo-stationary satellite. This satellite is in a 40,000 Km orbit above the earth, at a 'fixed' position. Any object between the tracker and the satellite , including the person's head or body, will cause the signal to be blocked. The other system is the use of either the GlobalStar or Iridium networks. These satellites orbit the earth at several hundred kilometers. While the Tracker units currently available have certainly improved in size and weight, they are in our opinion still not suitable for use by a person walking bush with a backpack. These units need to have a clear view of the sky to get proper connection to the satellite, any object like trees, and worse deep gullies will cause loss of signal. Even the head or body of the wearer will block the signal. Also, the cost of these systems is high. The Trackers are not cheap, and the operating costs can be high. In the APRS system as we are currently using it, all trackers transmit a location every 30 seconds. This would become very expensive if 15 teams with 15 satellite trackers would be in the field for days at the time. The SARTrack system use is free. Then there is the problem of the downlink. Almost all satellite tracking systems advertised at the moment, are based on the signal being received somewhere in the world (and not necessarily in New Zealand) by a satellite ground station. It then uses the Internet to get the data to a server, owned by the company who sells the trackers. Then, special software running on the user's computer logs onto this server, and then shows the received data on the screen... But only if the end-user has Internet access! If the forward field base has no Internet connection, the system cannot be used. Satellite trackers can be an excellent choice for vehicles, boats and aircraft, who generally have a clear view of the sky, can use a high-gain antenna and have the battery power to spare. The data will be forwarded to a permanent operations center with permanent Internet access. But for teams tramping in the bush, with often a forward field base also in the bush, these systems are, in our opinion, not suitable. Also, software especially designed with special features for Search and Rescue is not available. The SARTrack system consists of a case with Trackers, a couple of small portable Digipeaters, and a laptop with a hand held radio attached to it. The whole system can be quickly set up in any remote location, and is completely independent of outside communication systems. If the portable repeaters can access a permanent repeater and get connection with the outside world, more options open up, but it is not required. SARTrack no longer builds the Trackers and Repeaters, but our design is available on request. I may start building the Backpack antennas again in the future. If you are interested in these, please contact me. 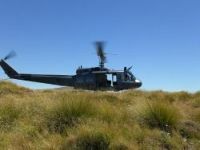 New Zealand may have free use of our dedicated nationwide VHF frequency om request. The location of permanent repeaters, and the programming and callsign allocation of all Trackers and Digipeaters is under control of SARTrack Limited, to make sure the system will be of benefit of all users, and to avoid overload of the frequency.